From June 6- 12, NCCF hosted a staff-driven community service week led by the newly formed Community Impact Committee. Focusing on hunger and food insecurity across North Carolina, the inaugural initiative of the committee facilitated service projects across the state and encouraged food donations to the Food Bank of Central & Eastern NC from our Raleigh headquarters. The service week met the mission of the newly formed committee by engaging NCCF staff in service, giving and awareness directly with communities served by nonprofits. The service week began on Monday morning with a volunteer project in the heat of Eastern North Carolina at the Conetoe Family Life Center. NCCF Regional Director Kelly Lee organized the project and joined NCCF staff and local affiliate board leaders for a day of produce harvesting and healthy foods awareness. Pictured above (left to right) are Kelly Lee, local leader Rev. Gray and Marketing and Communications Specialist Louis Duke (front row) and Administrative Assistant Sheila Cratch, Retired Regional Associate Mary Anne Howard, President and CEO Jennifer Tolle Whiteside and community member Mrs. Bunch (back row). NCCF staff and friends are pictured above picking peas and other produce on the farm at the Conetoe Family Life Center. Above are staff members Jennifer Tolle Whiteside, Louis Duke, Sheila Cratch and Kelly Lee working with local community members in the community garden. Service continued into the following day on the opposite end of the state as Regional Director Colby Moore facilitated a volunteer project at the Hickory Soup Kitchen. Pictured below are scenes from food preparation inside the soup kitchen. 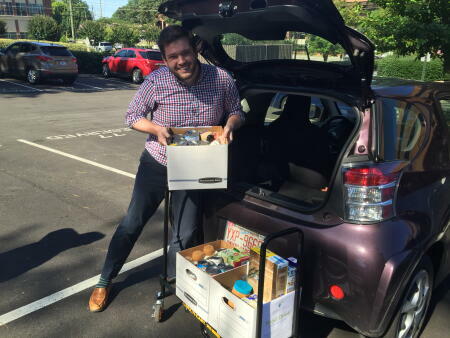 Additionally, NCCF staff collected nonperishable food items for the food bank throughout the week, gathering three boxes full of donations for the Food Bank of Central & Eastern NC from our Raleigh headquarters. Pictured below is staff member Louis Duke loading boxes with delivery volunteer and Gift and Development Specialist Melinda Allen. Affiliate leadership also got involved. 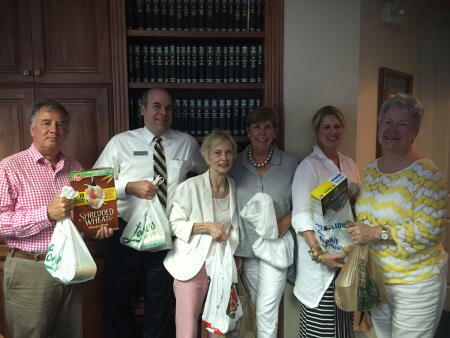 Members of the Moore County Community Foundation Board of Advisors hosted a food drive at their board meeting. Pictured below are board members (left to right) Russell Sugg, Gary VonCannon, Alice Robbins, Betsy Best (president), Claudia Miller (secretary) and Ellen Airs (grants chair) with their donations. 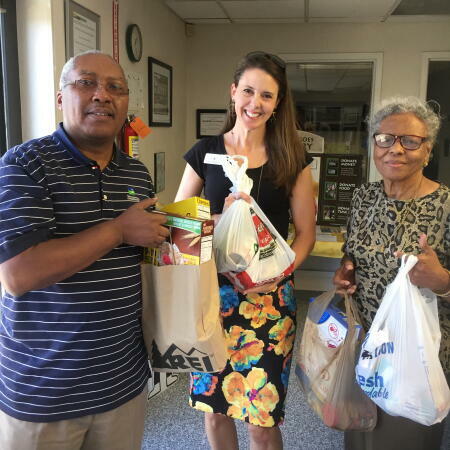 Additionally pictured below is Regional Director Dawn Neighbors delivering the donations to the food bank following the meeting. Finally, staff and friends in the Raleigh office gathered Saturday morning to volunteer at the Oak City Outreach Center, helping to feed the homeless and meet the needs of those in need in downtown Raleigh. Director of Marketing and Communications Noël McLaughlin, Director of Grants and Scholarships Leslie Ann Jackson and Louis Duke volunteered their Saturday morning to join NCCF friends and partners for a time of service. Pictured below is Louis Duke with NCCF friend Mike McLaughlin setting up tables for food at the Outreach Center. Be on the lookout for upcoming Community Impact Committee initiatives in your area as the committee continues to carry out its mission of encouraging awareness, service and giving within NCCF. Committee members include Colby Martin, Manager of Information Technology D’Wayne Wilkins, Regional Director Katie Crumpler, Kelly Lee, Leslie Ann Jackson, Louis Duke (chair) and Melinda Allen.